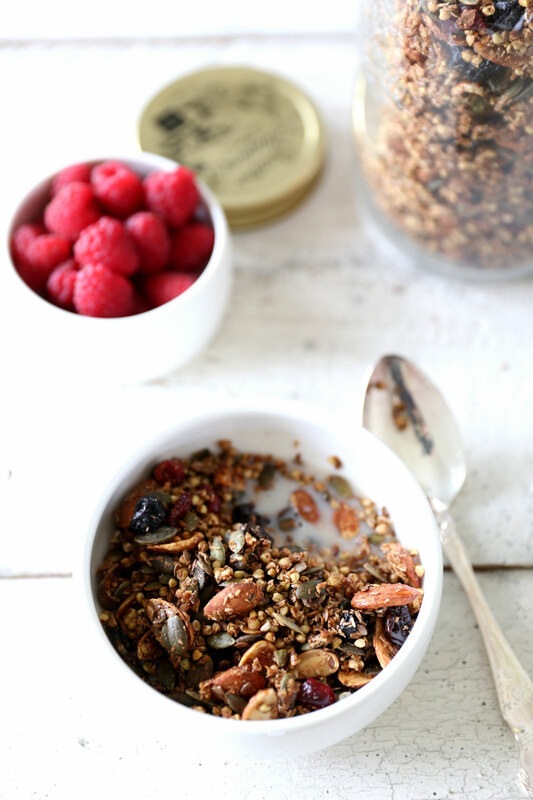 This maple and cinnamon buckwheat granola is what I eat for breakfast most mornings and is essentially the oat and banana free version of the crunchy maple banana granola (what Nick eats most mornings!). I couldn’t find a really delicious muesli or granola that was completely gluten free or not full of weird corn flakey things or added sugar, so I started making my own. Buckwheat groats are a great oat substitute, especially for a granola style muesli. 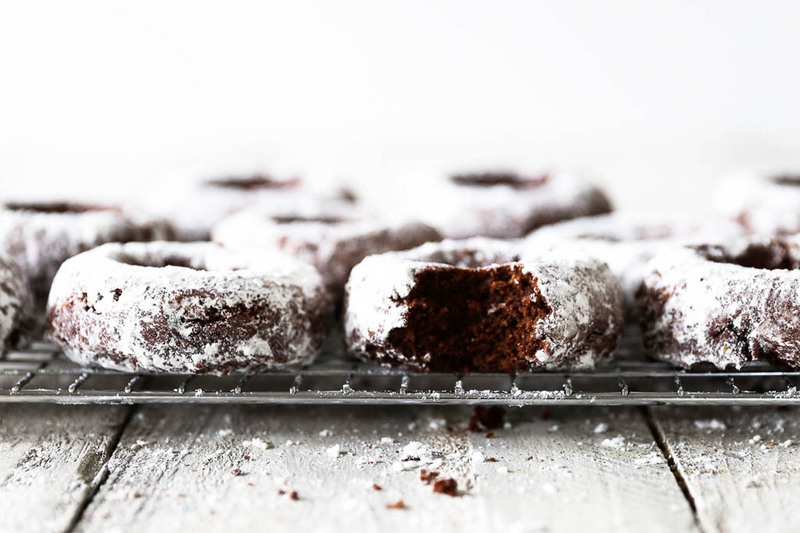 They’re completely gluten free and are packed full of plant protein and dietary fibre. From there I’ll usually add whatever nuts I have in the pantry, such as almonds, brazils and pecans. 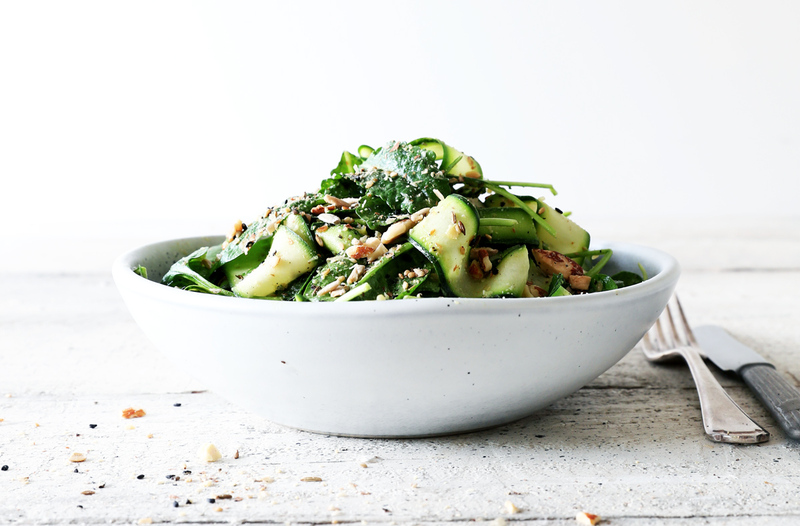 Pumpkin seeds and whole flaxseed are great protein and fibre sources, and add to the granola crunch. For flavour I use ground cinnamon, ginger, coconut and vanilla powder, with a little pure maple syrup for sweetness although this can be left out. After baking I’ll throw in some dried fruits like cherries, blueberries and cranberries (ideally sugar free if you can find them). 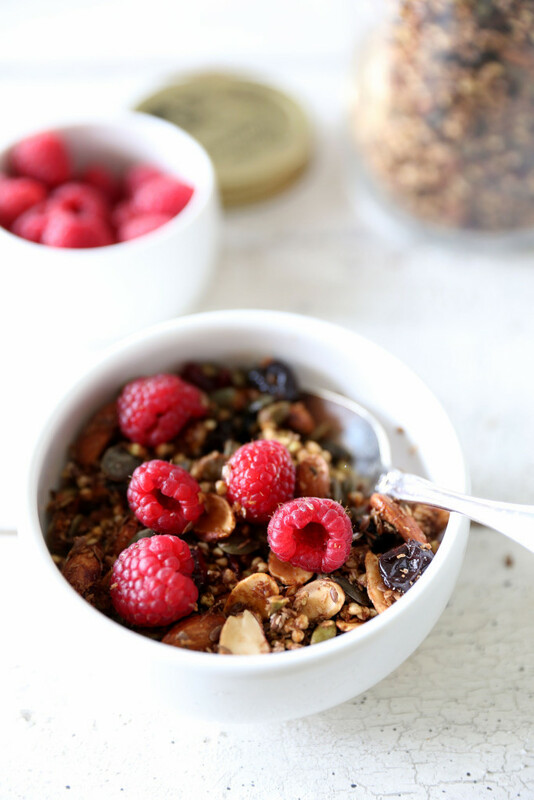 This granola is super easy to make, the hardest part is waiting for it to come out of the oven as it smells so good! 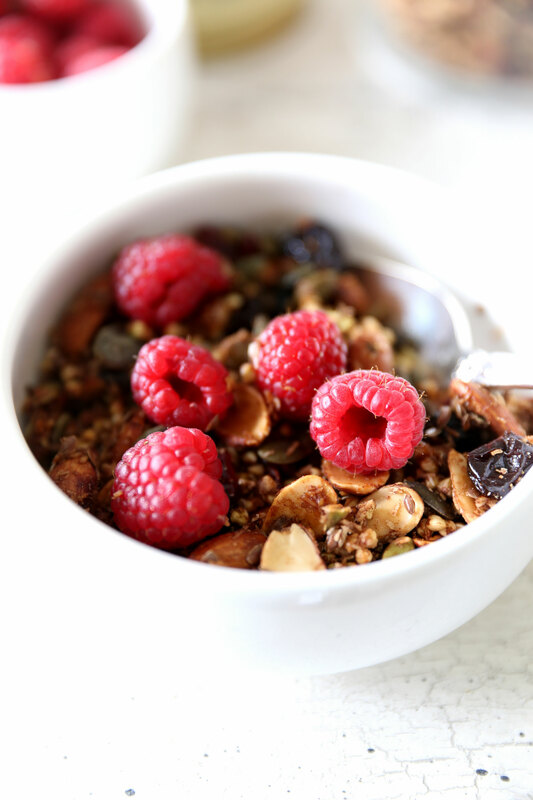 When stored in an airtight container this granola will last for weeks, however, you’ll probably eat it way before then! 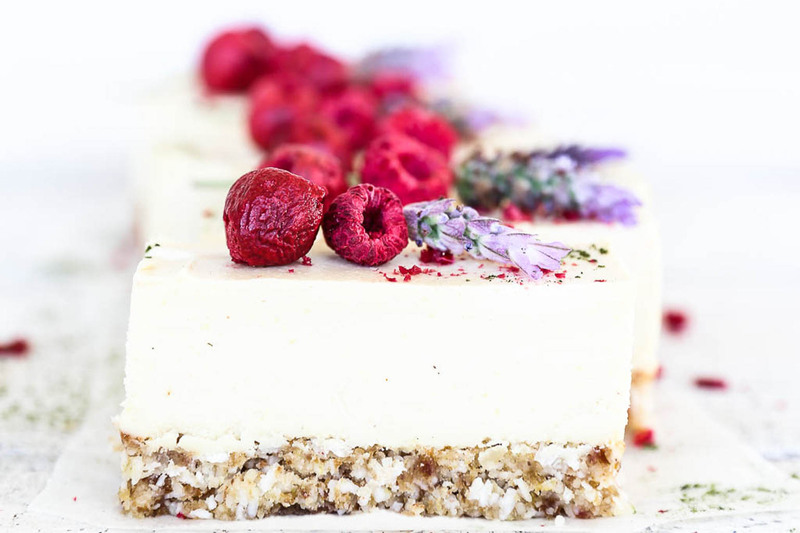 It’s also great as a snack eaten straight from the jar or sprinkled over the top of a smoothie bowl or chia pudding. Enjoy! Soak the buckwheat for 2-4 hours. This part isn’t optional as the buckwheat groats need to absorb some water so that they don’t go crazy hard after cooking and break your teeth! The soaking also makes them easier to digest so it’s win win. After soaking the groats wash them very thoroughly as they let off a mucilaginous substance which you want to remove completely. Next combine the well drained buckwheat groats in a large mixing bowl with everything except the pure maple syrup and dried fruit. Stir well to combine and then add the maple syrup, again stirring well to ensure it’s evenly mixed. Spoon the granola mix onto two lined oven trays and fan bake at 100ºC for approximately 30-45 minutes. You are aiming for enough moisture to evaporate from the buckwheat groats so that they just become crunchy and will be able to be stored in the cupboard. They will still be a little soft when they come out of the oven but you will know they are ready when they harden up on standing. If they are still a bit chewy, return the granola to the oven for a bit longer. Once out of the oven, add the dried super fruits to the granola and leave to cool on the trays. Store this maple and cinnamon buckwheat granola in a large air-tight jar or container in your pantry. Activating almonds: Simply place the almonds in a bowl and cover with filtered tap water. Leave to soak for 10-12 hours. Drain the water off and rinse well. This removes the natural enzyme inhibitors on the outside of the almonds that make them difficult for our bodies to breakdown and digest. Place the drained nuts on a lined oven tray and place in oven at the lowest fan bake temperature possible with the door slightly ajar – I use a wooden spoon shut in the door as this allows just enough gap for moisture to escape (or use a dehydrator if you have one). Dry the nuts this way for until they are dry to touch and easy to crack apart. The rest of the drying will happen with the granola. Again, this part is optional. The granola will still taste just as good without activating and drying the nuts. Pure maple syrup: Make sure you get the real deal. There are quite a few maple syrups out there that are actually just maple flavoured sugar syrup, full of additives and often high fructose corn syrup. The real deal only lists “pure maple syrup” under ingredients and is made by a natural process of extracting the sap from maple trees, evaporating off excess water then filtering to remove impurities. While it is still a form of sugar it has a lower glycemic index than refined sugar and contains some minerals and antioxidants unlike refined sugar. 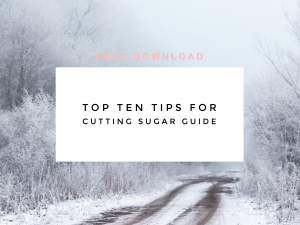 Pure maple syrup is therefore a better choice of sweetener, alongside honey and coconut sugar, if you need to use a sweetener. However, it is still best used in moderation. Just made this without the Maple Syrup, its lovely. Could do with a bit more spice if you wish.